A Society of Collision Repair Specialists video released last week outlines five steps auto body shops and insurers can take to avoid overlooking energy transfer-related hidden damage on a customer’s car. The video, formally announced Wednesday, summarizes and builds upon SCRS Vice President Kye Yeung’s presentations during the April CIC Week. Yeung, also the owner of European Motor Car Works, demonstrated through crash test videos just how energy moves through a vehicle — sometimes to the point that a left-front impact can affect the right-rear of a vehicle. “These crash videos remind us … it is important that we follow the energy transfer, not just to inspect the point of impact,” the narrator states in the video released June 29. As the narrator notes and crash videos demonstrate, OEMs are designing both unibody and body-on-frame vehicles so energy passes around the passenger cage. “Note how safe the occupants are,” the narrator points out after one video. 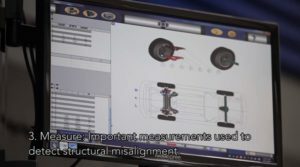 I-CAR also recently noted that the most common OEM design change was to strengthen the occupant area of the car, according to the video. The night-and-day difference between older designs and modern one was famously demonstrated in 2009 by the Insurance Institute for Highway Safety, which crashed a 2009 Chevrolet Malibu into a 1959 Chevrolet Bel Air. (Footage from the test appears in the SCRS video.) And remember, this is in 2009 — three years before the IIHS instituted the small-overlap crash test that’s been shaking up newer OEM body designs. Collision dynamics: Know what the vehicle does in a crash, particularly the body-in-white. Besides OEM presentations, the IIHS has a full library of crash-test videos, as does the federal NHTSA. The IIHS, however, has the small-overlap test, and OEMs design taking that into account. Visual inspection: Look at the vehicle and see if there’s any tipoffs of structural damage. This was demonstrated in the first of the two-part Collision Hub reinspection series. Measure: This is a no-brainer. 3-D-measure the vehicle, and it’ll be obvious when something pre- or-post repair exceeds factory tolerances. Analyze: Combine the previous three steps and OEM build tolerances to figure it out how bad it really is. 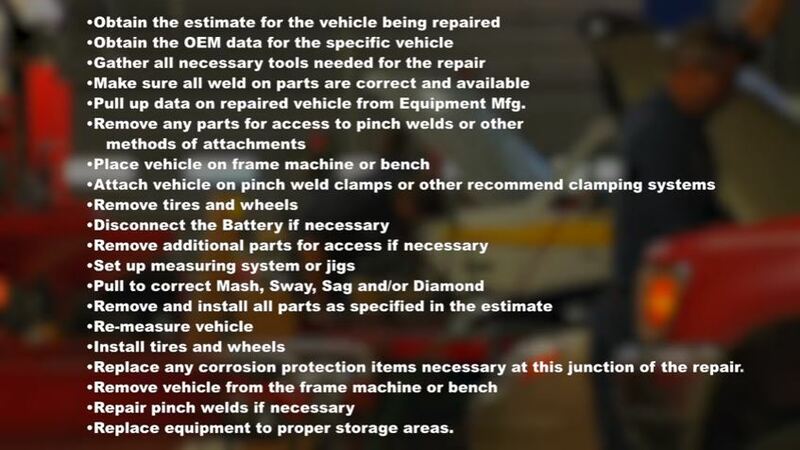 Repair planning: Armed with the data from Steps 1-4 and OEM repair procedures, develop a complete battle plan for how the vehicle will be fixed. The last of these might have more steps and repair time than an initial estimate had determined. A slide of all the steps that might be necessary to measure and fix a structural misalignment demonstrates this point. “You can see the potential gaps in proper compensation,” the narrator states. The 5-step SOP and remembering the estimating service caveat helps insurers, too. You don’t want to think a vehicle’s repairable, start paying for a teardown, and then realize the vehicle was really a total loss because you and the repairer missed something. More education committee videos can be found on www.youtube.com/SCRSCollision.